Oncolytic viruses are a concept I’d like to be more excited by than I am.2 It’s an idea that seemed really exciting when I first came across it, but the more I thought about it the more dubious I was. But a recent paper helps me feel better about at least two of my worries. The concept is a straightforward one. 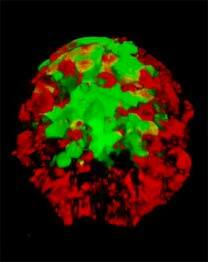 Viruses are good at killing cells.3 Why not have them infect cells that we want to die? That would be, for example, cancer cells. So all you need to do is find or make a virus that only grows in cancer cells, and you’re cured. Simple! Tomorrow we’ll fix global warming! There’s the obvious problem with this: How can you find (or make) a cancer-specific virus? In principle the answer is the same as with chemotherapy; you use the ways cancer cells are different from normal as targets. This isn’t as hard as you might think. 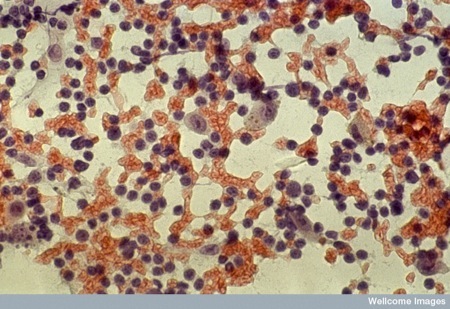 Lots of the things that make cancer cells cancerous are similar to the things viruses like. Viruses often drive infected cells into a cancer-like state that is more hospitable to the virus — friendly to nucleic acid replication, replication, unresponsive to death signals, independent of the signals that normally regulate growth. So lots of viruses are already kind of pre-adapted to replicate well in cells with a cancerous phenotype, and it doesn’t take all that much tweaking to make them adapted to only replicate well in cancer cells. The first runs at this technique that I knew of5 used mutant herpesviruses,6 but I think that much of the buzz came from work with defective adenoviruxes, especially the ONYX-015 virus.7 The approach here was based on the observation that adenoviruses (like many other viruses) normally inactivate p53 during infection. p53 is a multifunctional growth regulator that is very often also inactivated in cancers, for the same reason as viruses like to inactivate it:it oten triggers death in cells with unchecked growth. Adenoviruses lacking the gene that inactivates p53 (their E1B gene) can only efficiently infect cells lacking p53 — which would usually be, of course, cancer cells. 2. Especially in the face of an immune response. 3. Killing all of the cancer cells, not a mere 99% of them (from which the cancer will rapidly recover). A paper in Nature Medicine11 offers encouragement on all of those. They used VSV as their cancer killer, and their twist here was to deliver it by loading it onto T cells. T cells naturally traffic to lymph nodes, and quite a few tumors metastasize through lymph nodes; the T cell therefore acts as a ferry to deliver its deadly viral cargo to the metastasizing tumor. (The goal here was not to clear the primary tumor, but to prevent metastases, which are often the major problem.Â However, they did see some effect on the primary tumor, too, in some cases.) When it reaches the lymphoid tissue, it delivers the passenger virus to the cancer cells, the only ones that the VSV can productively infect (since the cancer cells are the only ones that have mutated their interferon pathway). This is an interesting idea, though limited in this form — I wonder about using antigen-specific T cells instead, to target the virus to a specific site — and it seemed to work quite well. In vivo tumor cell purging resulted both from direct viral oncolysis by virus released from the T cell carriers and from the priming of protective antitumor immunity, which prevents repopulation by further waves of cells metastasizing from the primary tumor. — just as described in the paper by Apetoh et al13 that I talked about here. The authors suggest that because the cancer metastases are being killed in the lymph nodes, rather than in the bulk of the tumor (which is generally a highly immunosuppressive environment) the immune response was more efficient. That starts to get past my concern #3 above, because it offers multiple attacks on the tumor, not just the virus. The data are still very preliminary and inconclusive, but certainly it’s a step in the right direction, and I feel better about this whole approach than I did before reading the paper. ONYX-015, an E1B gene-attenuated adenovirus, causes tumor-specific cytolysis and antitumoral efficacy that can be augmented by standard chemotherapeutic agents. Heise C, Sampson-Johannes A, Williams A, McCormick F, Von Hoff DD, Kirn DH. Nat Med. 1997 Jun;3(6):639-45. This entry is filed under Cancer, Immunology, Science, Virology. You can follow any responses to this entry through the RSS 2.0 feed. Both comments and pings are currently closed.